Limited number of $100 VIP Packages available! Includes show ticket, t-shirt, chance to spin the Big Wheel backstage and a photo with the host. It is the hit interactive stage show that gives contestants pulled right from the audience the chance to “Come On Down” to win appliances, vacations and even a new car by playing classic games from television’s longest running and most popular game show. 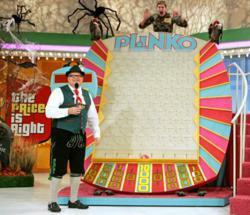 From Plinko to Cliffhangers to the Big Wheel, and even the fabulous Showcase, all the favorite games are played just like the TV show. Celebrate this exciting “Price Is Right” show with some deep discounts from the trusted Pittsburgh plumber, offering expert plumbing tips to consumers. “Not every plumbing need, needs a plumber,” says Mr. Rooter. Limited number of $100 VIP Packages available! Includes show ticket, t-shirt, chance to spin the Big Wheel backstage and a photo with the host. Vote today at our Facebook page for a chance to win. Look for the Mr. Winky vs. Pirate Parrot "Who Is Better Looking" contest. Winner announced by email notification.